Compact, slow growing evergreen with a very neat dense habit. Dark green foliage with a woolly indumentum underneath. 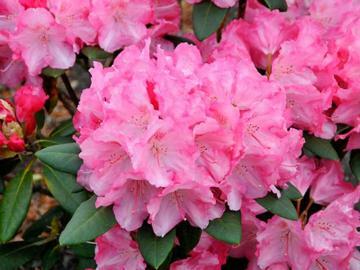 Abundant large trusses of bell-shaped pink flowers, darker at the edges and much paler in the centres, giving a 2-tone effect. They open from red buds in May. A Rh. yakushimanum hybrid. Raised by Hans Hachmann, Germany, 1983.